We were staying at a hotel over the weekend and our room afforded us a good view of the cityscape to the left and seascape to the right. We weren’t able to get a good view of the sunset as we were practically facing south-east and the orientation of the window prevented any, even slight view of what is always a nice Manila Bay sunset. We did expect to see the sunrise the following morning. As the sun came up, we took this photo of the cityscape. Closer to us were buildings in Pasay City while those farther away were buildings in Bonifacio Global City. I remembered reading somewhere that what makes our sunsets so colourful or spectacular are the elements in our atmosphere. Air pollution tends to bring the most dramatic colors for sunsets and I believe that’s in a way also applicable to sunrises. I took a snapshot of the cityscape from our hotel window expecting the worst for what could be the equivalent of an exposed negative in the old days. 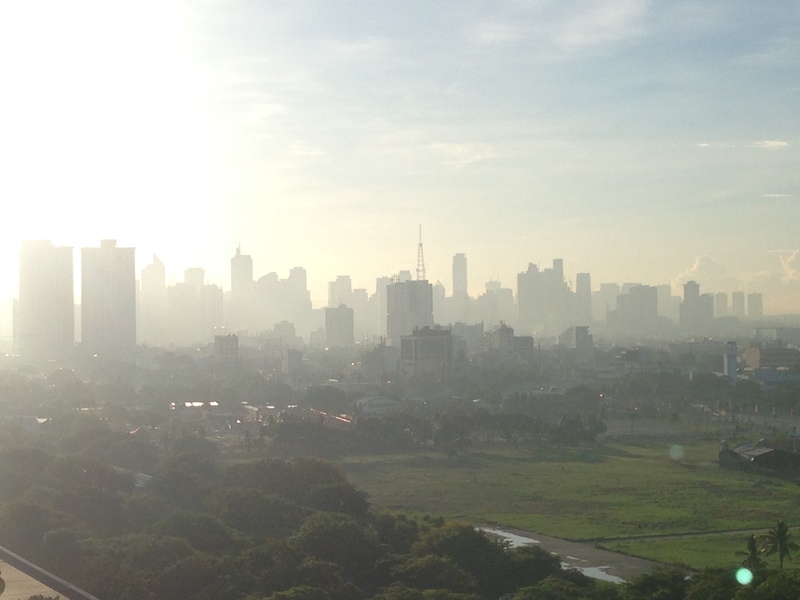 Instead, I got the pretty decent photo below showing the sunlight reflecting off the haze around Metro Manila and giving the cityscape that eerie look on a Sunday morning. There’s a joke that is often recycled concerning air pollution and air quality. According to this joke, the Philippines doesn’t need to worry about air pollution since every year it is visited by many typhoons. These typhoons passing through the country sweep away the pollution thereby making the air around us cleaner. This is actually true and one need only to get outdoors after a typhoon to smell the fresh air. Of course, it doesn’t take long before the smog returns and therein lies the punchline to the real joke. At the rate we are going in terms of vehicle emissions alone, we would probably need at least a typhoon every week for the entire year if we wanted clean air to breathe. The dry seasons would probably be the worst in terms of poor air quality. And so we must see that the joke is on us and air quality will only continue to deteriorate if we do not act now and do not pitch in for the fight for clean air. By d0ctrine in Air quality, Governance, Policy on June 27, 2014 .